The virions are spherical particles, 150-200 nm in diameter, containing a T=16 icosahedral capsid and glycoprotein spikes protruding from each virion. The major capsid protein VP5 (UL19) forms an icosahedral strcuture composed of 150 hexons and 12 pentons (total of 162 capsomers). Pentamers and hexamers of VP5 are linked together by heterotrimers called triplex. These triplex are formed by a single molecule of VP19C and two copies of VP23 which bridge major capsid protein VP5 multimers together. Two additional proteins are termed the capsid vertex specific components (CVSC) UL17 and UL25 since they are found uniquely at the vertices . The tegument is a set of proteins that are present in the space between the envelope ant the capsid. It contains proteins that allow early immune system inhibition, and prepare the host cell for viral replication. Here is described the process by which herpes simplex virion acquires its tegument proteins. Table which lists the identified tegument proteins from the major herpes viruses. Herpesvirus entry and membrane fusion require three virion glycoproteins, gB and a gH/gL heterodimer that function as the core fusion machinery. 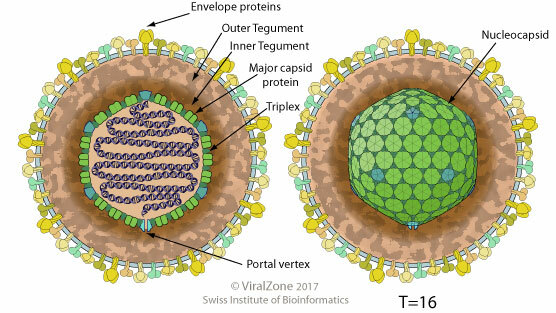 Tropism of Herpesviruses is often defined by accessory receptor binding proteins and receptors. Here is a list of glycoproteins present on different human herpes virions.